This master bathroom blends elements of daring modern style with mid-century touches that bring bright energy and character to the space. The clients are a young couple with an appreciation for design and art. 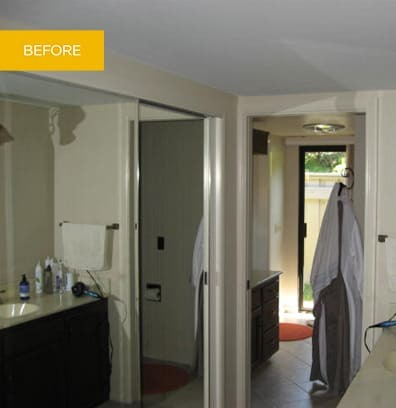 They wanted a master bathroom that would work as a luxurious and inspiring space for them while also being a safe and comfortable place for their toddler’s bath time. It was important that they be able to comfortably share the space with each other with varying levels of privacy. In a home with an emphasis on bold hues, the clients wanted to stay away from neutrals and embrace the energy of powerful color combinations. The light in the room is accentuated by a wall of windows and the bright lemon yellow of the oversized wall tiles. The tiles alternate between a glossy and matte finish, creating an intriguing sensation of depth. A periwinkle blue vanity is an imaginative contrasting color, illuminated by sparkling pendants of textured hand-blown glass. The wood flooring in the sink area transitions to a sloped floor to accommodate the open shower, where the textured wall and a series of niches delight the eye while providing practical functionality in this sumptuous oasis alive with color.